This entry was posted in Animals, Art Materials, Mixed Media, Painting Demonstrations, Watercolor and tagged Art Materials, fish, Japanese Paint, Mixed Media, painting, painting demonstration, painting materials, Ueba watercolor paint, watercolor demonstration, watercolor materials, watercolor painting by splashingpaint. Bookmark the permalink. so any idea where Santa picked these up? I mean the elves can’t make everything! 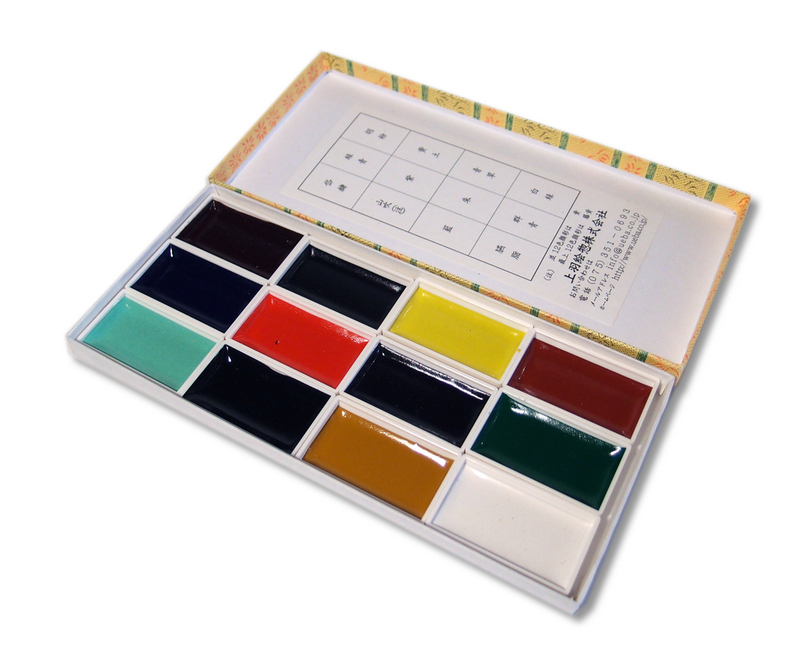 As far as I know the Ueba paints are only available in Japan. Not sure if Ueba ships internationally, but the email address on the box is info@ueba.co.jp and this is their website. There is no shopping cart on the website and navigation is a bit confusing ( they also make nail polish!) You may be able to have them sent out. John, you are very spoilt getting such nice paints from Father Xmas – and it’s a great barramundi. Yes, what a great Christmas present! I love following your adventures and hope to see more of you this year in person. As I have a Japanese daughter in law and extended family visiting in June for my grandson’s first birthday I may have a small link in the Japanese shopping chain in Kyoto. Wonderful that you received such a lovely gift John – and a fresh Barramundi on the canvas – and also on the plate is always wonderful. Barra on the plate would have been nice – I was getting hungry painting him! Lucky you – I like the sound of the pearlescent sheen. It was interesting to trawl through their website – maybe a diversion into nail polish painting is called for (on paper or canvas?). Delightful study, as usual. I’ll pass on the nail polish painting – anything smaller than a quarter sheet is too hard to see! Beautiful glowing colors on your barramundi! I wish I known about Ueba paints and could have asked Santa for them……… did they come in set? They come in a set of 12 or 24. They are available online in Germany (Link in Julie’s comment above) so I imagine they would be available elsewhere too. I for myself never got used to them, but the pans are incredibly big, great for bigger brushes. John, it is nice to see that you like them so much! Thanks for the link. Great to know they are available outside Japan. Hi John… one of my students gave me a set of those colors from her trip to Japan… now you’ve really tweaked my curiosity to try them out with a more serious bent. We just moved to San Diego, CA. I’ve got to run them down in a box and give them a better go! As always, your demos are terrific and I really appreciate your posting them! Your technique has given the barramundi an iridescent glow and really told the story!! Thats what I like to hear – just moved to a new city and the first thing you search for in all the packed boxes is a box of paints! How tempting you’ve made these paints look, John. Wonderful demonstration of the barramundi. As always your generosity is greatly appreciated. Happy New Year. Beautiful work. I am very anxious to see more. I love the colors and love to experiment with new materials. I’ll post some more experiments soon. Hi John, I loved the last bit of this demo where you used the rough brush and charcoal marks to push the barra back into the murky water. Now that’s what I call confidence!